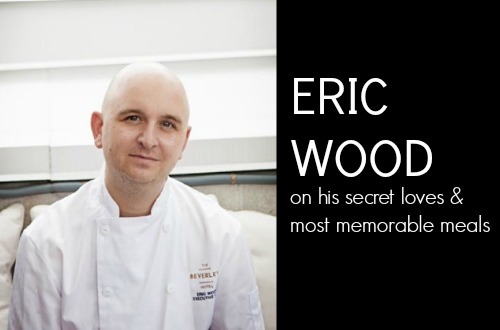 Eric Wood -- the chef at the helm of the super hot Beverley Hotel -- is a very likeable guy. There really isn't a more accurate way to describe this dynamic chef who is putting down roots in Toronto after years of globe trotting. Eric curates the March edition of the CHEF'S BOX. Eric Wood -- the chef at the helm of the super hot Beverley Hotel -- is a very likeable guy. There really isn't a more accurate way to describe this dynamic chef who is putting down roots in Toronto after years of globe trotting. Eric curates the March edition of the CHEF'S BOX -- a monthly dinner party in a box delivered by FoodiePages.ca. We got the inside scoop on his favourite Toronto spots, secret loves and top meals of all time. Signature dish: From the Sea -- fresh market seafood, some grilled, some steamed, with sweet corn puree, brandade potato, and Summer savoury. It's an homage to the beachside summer seafood cook outs and lobster boils that I have fallen in love with on the East coast. Hometown: Born and raised in Edmonton, but have made Toronto my home after bopping all over the country. Daily uniform: Pressed short sleeve chef's jacket, faded Levis 511, with a big cuff, Blundstone boots, sometimes a toque if it's chilly! I have a few: Shoes! I love sneakers and shoes, and have some really amazing pairs. Highlights would be HBC blanket Jack Purcell high tops, and a pair of Vintage Andre Agassi Reebok pumps. In the kitchen, I swear by: Masakage Zero Knives. My taste in knives just seems to get more and more expensive and rare. These things are gifts from heaven. The taste I couldn't live without: Cinnamon. love cinnamon. Be it in a tomato soup, or with game meat. Cinnamon is my buddy. Hidden talents: Singing. I took vocal training and musical lessons, and was in a couple of choirs and musical shows and stuff. Karaoke has happened. And will happen again. If my kitchen could talk, it would say: If these walls could talk, they'd probably ask us to be quiet. We get pretty lively on the line. Lots of joking, trash talk and general laughing out loud all day. Some days it's not so fun, but 9/10, the best place I could want to be. Coolest street in Toronto: Dupont Street always gives me a thrill. There's a bunch of really great restaurants, coffee, and a fabulous knife store. It's a great street up and down. I live in the East end, and Dupont Street is like a new world for me every time I get there. Last place I travelled: Vancouver for Business, Seattle/Portland for Pleasure. I love the West coast, especially the food culture out there, and Portland is just so cool. Most romantic thing I've done for a girl: Well, outside of marry her, early on, I made her a 123-song mix tape. It took me days, and I put A LOT of thought into it. It was borderline weird, but I think ended up in the win column. In life, what is most important to me is: My wife and soon to be baby. These two words change EVERYTHING! So, now I spend my time looking at strollers and stuff instead of fancy knives and stuff. Well, I still look. I get nervous when: The dining room is full, but the chit rail is empty. This means we are taking a trip into the weeds. 1. Beverley Hotel in Toronto: Amazing off-menu tasting by my Sous chef, with my parents, wife, niece and sister. It was intense. 2. Ned Ludd in Portland: Peak of summer, radishes, halibut, Fava beans. All in a wood oven. Super cool. 3. Ye Shanghai in Shanghai: Birthday feast, with amazing service, and incredible flavours. 4. Rafael in Lima Peru: Truly transcendent food, genius in every bite, really cool ingredients. 5. Langdon Hall in Cambridge Ontario: Honeymoon epic tasting, that just would not quit. Fact: I have never hosted a dinner party, and VERY rarely get invited to dinner parties, but will generally always say yes if there's an invite. In theory, I like to fire up the grill, do a nice melange of things off of there. Keep it very casual and fun. The food that I cook at the restaurant is pretty cerebral, so, at home, I like it simple and pure. The best farmers' market: The Leslieville Market really is the little engine that could. It has such a great culture and family spirit, DJ's and great vendors. The best burger: Setting aside my own burger, which is pretty special, I love the burgers at Holy Chuck on Yonge and St Clair. So over the top!!! The best cheap eats: Either the Singapore noodles at the Goof in the Beach, or a monster sandwich at Schnitzel Queen. There's a time and a place for a three napkin sandwich. My motto: You're only as good as the plates that go out when you aren't there, so invest everything in your people. They are the best thing you can ever make. The March CHEF'S BOX curated by Eric Wood is available on FoodiePages.ca until March 31st and includes incredible small batch foods as well as Eric's recipes for Salad with Cattail Hearts & Charred Beets, Thumb Print Cookies with Raw Creamed Honey (a take on his Grandma's recipe) and Spadina Blend Creme Brûlée.